Johnston Atoll, which consists of "four small man-made islands enclosed in an egg-shaped reef approximately 21 miles in circumference," located 718 miles from Hawaii, is for sale. 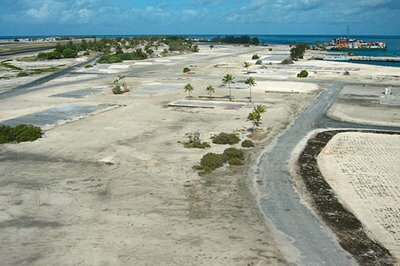 The current owner, however – the wonderfully named U.S. Office of Property Disposal – wonders if potential buyers might be "unaware that all buildings had been removed" from the island, and that "there were no functioning utilities or water supply, the runway was iffy, the golf course disintegrated, the seawall containing the nuclear waste dump was insufficient, and that nearest services of any kind are over 700 miles away." 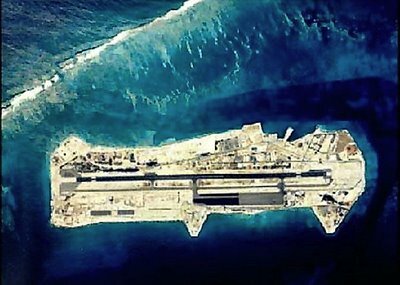 If you purchase the island despite all that, your land deed "will contain use restrictions because the atoll was used by the Defense Department for storage of chemical munitions and as a missile test site in the 1950's and 60's. The island can be used as a residence or vacation getaway" – but "the airstrip and the golf course are closed." Today, the Center for Land Use Interpretation tells us, Johnston Atoll is nothing but "a scab of concrete, slowly being covered in bird droppings." Meanwhile, the atoll's history as a U.S. nuclear test-site is fascinating: "In 1962," CLUI continues, "Johnston was used for a series of nuclear tests as part of Operation Dominic, which included the only U.S. test of an operational ballistic missile with a live warhead. For this test a Polaris missile was launched from a submarine, and traveled 1200 miles through space and the atmosphere, until detonating 11,000 feet above the ocean near Johnston. Also that year, the newly constructed rocket launch pad at Johnston was used for a number of extremely high altitude nuclear tests. On June 20, during 'Starfish,' the Thor rocket engine cut out a minute after launch, and the missile was intentionally destroyed, at 30,000 feet. Large pieces of the rocket, including some plutonium–contaminated wreckage, rained down on the atoll." (With images from CLUI – and with huge thanks to Mark, who recently tipped me on the island's existence. For more info, there is also this Wikipedia article. And if you're in the market for other strange real estate, consider purchasing this subterranean bunker-city). You can wade offshore for nearly a half mile by walking on top of the concrete bunker where munitions waste is stored. Been there. Done that. A little googling will let you assess whether you think the plutonium is still going to be a problem for your resort. I worked for Eurest, the company that supplied the wonderful free food for everyone, summer 2003. They tell you not to eat the fish. if someone does get this island, let me know! I'll come back and cook again! I think I was up on the JOC when this photo was taken... the last day, our final barge is leaving in the background.... and the 120,000 plants we planted in the last few months are off to the right.... ended up sleeping in boxes the last night until the C130 picked us up.... was an awesome experience. i was stationed on this island in 1974-75. It was mostly army, air force, some coast guard, and civilians (no women at all). shark fishing was great, diving was great (lots of red coral). there was an underground hospital, an outdoor bar, a national park (maybe 8 or 10 trees in it). Don't remember any of the trees in one of the photo's here. there was also an outdoor movie theatre. I don't remember a golf course. a good place to visit for a few days, not for a year. Life's a beach, and then you die? Johnston Island is not for sale because it is a wildlife refuge. The "for sale" ad was just a test ad that was not supposed to be published online. The island was not offered for sale by GSA. I was there in 1995 and had a really good time. The only thing I thought about while I was there was going home, but when you got home you wish you could go back. Scuba diving was the best and I logged over 200 dives while I was there for a year. I'm looking at Google Maps and there are 2 areas that have been "colored" in, does anyone know what was there? Near North and East Islands. I was there from 1990 till 1991 and loved every minute of it. Boating, diving, golf and 6 days of hard work (day and night). I severed in the US Army from 1989 till 1995. Remember the only places where you COULDN'T buy a beer? Post office, church and JACADS... How many bars? Tiki lounge, Shark shoot, ...... Cannot remember the others. I was there from 98-99 and loved the duty, the place and the people. Some of the greatest diving in the world. The job we did was awesome when you think of it. Those of us who served there are a little known part of history, not just US but human. I often think of the long days down range in the bunkers doing RICRAs and OPEN and CLEARS. It was nerve racking sometimes but the troops there were tops for the most part. The beer was always cold and the parties were great! If you weren't there we can't explain it to you. 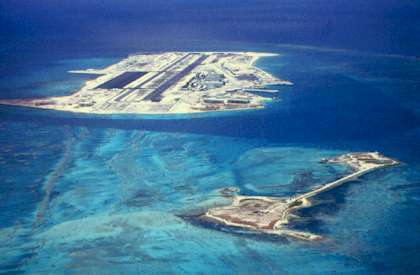 I spent one year there (1967) working in secure communications in the JOC building, which, besides some nuke storage bunkers, is the only structure still extant on the atoll. Couldn't have a camera to take any pictures back then as the then-mission was super secret. Saw many a movie in the outdoor theater and ate (too) well in the mess hall with Holmes & Narver providing. We were able to take the occasional short weekend "R&R" to Hawaii, flying on civilian or military craft to Oahu.